I’m a huge Buffy fan but I prefer seasons 1 through 3 instead of the subsequent seasons. I find this a bit puzzling because I tend to like books and movies with adult protagonists more than teenagers. And yet Buffy is clearly very young during the seasons 1-3. Then again, I’m of the opinion that the first three season hold together far better plotwise and thematically than the later ones. (I especially disliked witchcraft as symbol for two different things which aren’t related to each other.) Still, there are episodes in the later seasons which I just love. The story starts a couple of years after the end of the TV-series and the world has changed. 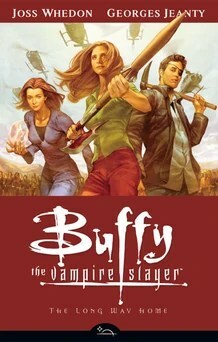 There are many Slayers now and Buffy and the gang are trying to mold them into a fighting force against the (supernatural) evils of the world. Buffy and Xander are in Scotland leading and teaching a strike team of Slayers while Andrew is in Italy and Giles is in some Islamic country. Willow is doing her own thing with Kennedy. Buffy and a strike team take out a nest of demons. There they find out that the demons’ victim has a strange marking on his chest. Meanwhile, General Voll and his men are watching the Slayers. The General is convinced that Buffy and the Slayers are a threat to society or at the very least to the General’s own plans. His people have been investigating the remains of Sunnydale and have found two survivors there. One of them is Amy who really wants to kill Buffy. Meanwhile in Scotland Dawn has grown into a giant. She refuses to tell how (or doesn’t know) and only wants to talk to Willow. Rumor has it that she dated a triple witch and he transformed her. Xander is leading the operations center while Buffy goes out as the leader of the strike team. Soon, Amy attacks. 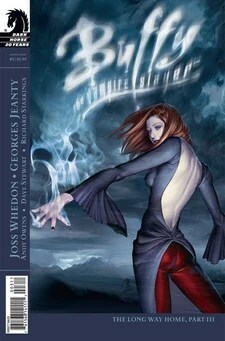 She puts Buffy under a sleeping spell and has an army of undead attacking the Scottish castle where the team is staying. It’s nice to see that much of the charm of the Buffy –series is still here: humor, pop culture references, witty dialogue, plot twists. The basic situation is, of course, rather different; instead of a small group of (teenaged) friends who try to save the world and keep the police in the dark, the Slayers are a big group with all sorts of technology and apparently even a team of witches working for them. Still, many of the new characters remain faces in the crowd and the focus is on the old gang. There are also lots of references to characters and the events in the series. Even Ethan Rayne makes a guest appearance. The last story is about a Buffy look alike who gets a very dangerous assignment. 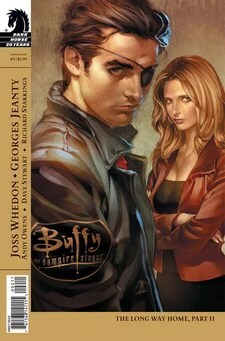 If you’ve never watched Buffy, I would definitely recommend starting with the TV-show and not with this comic. Art: Art gets just a ‘meh’ from me. I didn’t hate it which is always a positive sign but I didn’t love it either. The characters don’t really look like the actors although getting that right would have been very difficult anyway. I really liked the covers, though. Overall: There is enough of a mix of old and new to make me a happy old Buffy fan! This is the first book in a space opera trilogy called Trade Pact Universe. You can read an an excerpt here. This is also part of my 1st in a series challenge. To me, the Trade Pact universe is similar to the Babylon 5 universe. While the TP universe has both humans and other sentient creatures (which for once are called different species and not erroneously races as is very common!) I got the impression that intermarriage between different species isn’t common like it is in for example Star Trek where aliens are just humans with bumps in their heads. On the other hand, the main characters of the romance are of different species. Yet, on the third hand the mixed species romance horrifies others so I’m pretty satisfied, world-building wise. The name of the series seems to be a bit of a misnomer; while the setting is inside the Trade Pact space, the main character is a Clanswoman and the Clan is not part of the Trade Pact. The members of the Clan look exactly like humans but they have awesome psychic powers: telepathy, teleportation, and empathy. Some seem to have other powers as well. The Clan rank themselves according to personal psychic power and so they want to breed more powerful children. They have a Council which decides who are mated and when they should have children. However, the Council was formed because Clanswomen require a mate whose powers are stronger than hers. If they aren’t the prospective male is killed. So, the Council was formed to see who would be the most compatible mates. Emotions aren’t considered. This process is called the Choice which is ironic because it’s a biological imperative and any choosing is done by the Council and not the people in question. Trade Pact Enforcer P’tr wit ‘Whix is following two Clan members to spy on them and to report their doing to his Commander Lydis Bowman. Unfortunately, the pair is attacked. The Clansman is arrested but the Clanswoman slips away in the confusion. The woman’s point-of-view is written in the first person. She has no idea who she is or where she is and she doesn’t know much about the world around her. But she learns quickly and we readers learn with her. However, there is a strong compulsion in her mind which practically forces her to stay hidden and to seek escape from the planet. She obeys it as best she can while searching for any clues about her identity. She encounters space ship Captain Jason Morgan and is convinced that he can take her off the planet. Unfortunately, he doesn’t agree at first and in short order a press gang captures our heroine. A reptilian pirate captain takes a liking to her (as a moving snack or a possible hostage worth some money) and gives her the name Kissue. However, she manages to escape and flee to Morgan’s ship, the Silver Fox. Morgan takes pity on her and agrees to take her off the planet. Morgan also gives her the name Sira Morgan. Almost every other chapter is in third person and also in different font. These chapters concentrate on matters that concern our heroine but which she can’t know. We find out quite a bit about the Clan, the world, and Sira through the other characters in these chapters. The arrested Clansman Barac du Sarc turns out to be Sira’s cousin and her intended lifemate. He is intent on finding Sira even after the Enforcers tell him that his brother has been murdered. Barac contacts another Clanswoman, Rael, who is also intent on finding Sira. Apparently, Sira had agreed to the blocking of her memories but now her condition is, of course, rather dangerous. Barac also contacts Captain Morgan who seems to have some dealings with the Clan. Reluctantly, Morgan agrees to search for Sira but when he finds her, he doesn’t tell that to the Clan. During the days that it takes for the Silver Fox to get to another planet, Sira tries to adjust to a space faring life. She also feels a need to have a connection with Morgan which confuses her. The book contains a few intriguing details about the setting such as the obvious rivalry between the Enforcers and the local police forces and few things that we get to know about various non-human species. Hopefully, we get to see more of these in the upcoming books. I rather liked the cast of characters. Sira is quite a sympathetic heroine who is doing her best to survive and understand what is happening to her. However, we do find out that she is very special among her own kind. Jason Morgan is a human telepath and has isolated himself from others because he finds his talents hard to control enough to interact normally with non-telepathic humans. However, he starts to grow very fond of Sira. There’s also Huido who runs a restaurant and is Morgan’s blood brother. Huido belongs to an alien species who resembles a robot more than a human. Neither human nor Clan telepathy can affect him. The only human food or drink he can digest is beer. He’s very loyal to Morgan. Clansman Barac is also a sympathetic character and I rather enjoyed the brisk and efficient Commander Bowman, too. Humans have managed to research technology which blocks the abilities of Clan members so naturally, the Clan is rather suspicious of humans. The Clan is quite small so they don’t have their own planet. Instead, they want to live anonymously among humans and other species. This often means that any non-Clan beings who know about them are killed. While the Clan seems rather ruthless they are trying to survive as best they can. The book has two central plots: the mystery of Sira’s condition and the romance. The mystery is pretty intriguing and it changes along the way. First, Sira wants to know who took away her memories and why. Then she starts to question who was the earlier Sira and if she was restored, would there be anything left of Sira Morgan? The mystery plot is well done and I rather enjoyed it. While the romance isn’t as appealing to me personally, it’s not annoying either. However, there is one aspect which might be problematic: before the Choice Clanswomen are prepubescent in appearance. When she Chooses a lifemate, she will instantly look like a mature woman. However, because she can’t age before the Choice she can be many decades old by that time. So, even though an unChosen Clanswoman can look like 9 years old girl, she can actually be forty or so years old. Sira felt like emotionally mature woman to me. But it did squick me a little when I remembered that she looked like a prepubescent girl to Morgan. Overall: I liked Czerneda’s writing style, characters, and the universe enough to get the next two books in the series. Just one? That’s though. I’ve suffered through quite a few literary classes in my time. Perhaps Hemingway’s Sun Also Rises which to me was absolutely pointless and yet I had to say and write something semi-coherent about it.